Add (Experimental): Support Camera2 API for devices running Android 6.0 or above. -> As notice in the option, not all device can benefit from Camrea2 API. For an example, on Huawei Nova Lite (PRA-LX2), Communication-Light is totally not working with Camera2. Whereas, with classical API, it's working when WPM is <= 6. Add: Share custom alphabet table as text file. 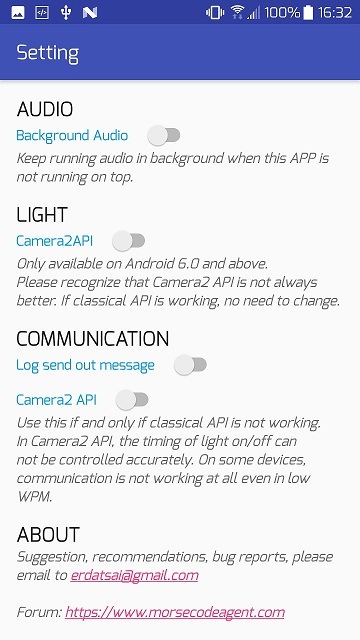 Improvement: Increase compatibility of classical Camera API, and remove "Safe Mode" option. "Safe Mode" will be applied automatically. -> It's found that some devices lacking camera features like flashlight cannot open camera. Now App detects features before opening camera. For an example, ASUS Zenfone 4 (A400CG) has no flashlight and Decode-Light crushed on previous version. Fixed: Some devices cannot finish Decoding-Light task in time and fail to decode anything. -> This is found on some middle-end and low-end devices. For unknown reasons, the Decoding-Light task is running very slow and most input data is lost. By improving performance, Decode-Light is working on them now.